Beaverton, Ore - VTech Communications, Inc., a wholly owned subsidiary of VTech Holdings Limited (HKSE: 303), today announced it will introduce a new line of wireless monitoring solutions for the connected home at the 2015 International CES® tradeshow. The products leverage a superior new technology that makes them more secure, affordable, easy to install and use, and able to work at longer ranges than current home monitoring products on the market. Wireless monitoring systems offer homeowners new levels of control, serving as an extra set of eyes and ears. With VTech's free app and broad range of connected devices, homeowners can monitor and control what's going on in their homes-whether at home or away from home. VTech achieves this through a combination of ULE (Ultra-Low Energy) and WiFi technologies. A baby monitor system: Integrated ULE sensors give new parents an extra layer of security. An open/closed sensor notifies them when a door or window is open in a child's room, while a motion sensor can alert them when their toddler awakens from a nap, for example. A cordless telephone system: Homeowners who want an in-home alert system can program this phone to notify them if any of their ULE sensors are triggered. If they've left a door open, including the garage door, they can receive a voice alert through the cordless phone system. They can also program the phone to call them at an outside phone number if they are away from home. 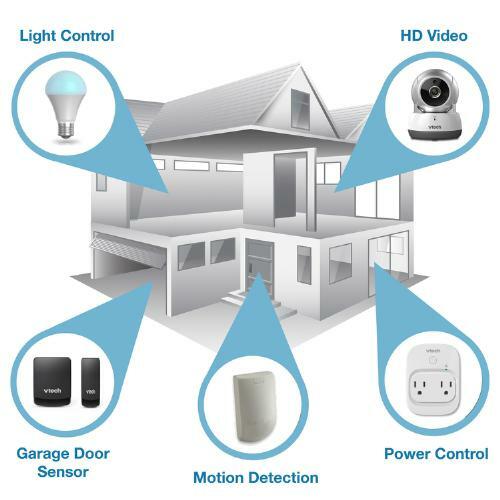 An IP hub: The company's IP hub provides Internet connectivity to a wide variety of ULE-enabled sensors and devices, allowing homeowners to monitor and/or control them through their VTech app wherever they are. High-definition (HD), remote-access cameras: VTech's HD, remote-access cameras let homeowners view and record high-definition video directly through an app on their smartphones or tablets. The app can also notify users with push notifications whenever the cameras pick up activity in the home. Smart sensors and home-control devices: A wide variety of wireless ULE sensors will be available to supplement the company's wireless monitoring solutions, including open/closed, motion, glass-break, siren and flood sensors. In addition, home-control devices like AC power outlet controls and LED lighting will allow homeowners to program and turn on LED lights, music or anything that plugs into an AC outlet-right from their smartphones or tablets. "VTech wireless monitoring solutions ensure that homeowners feel secure and comfortable at or away from home," said Chris Conrad, product marketing director. "Smart home technologies should not be limited to tech savvy consumers. Leveraging a proven consumer friendly, long range wireless technology allows us to significantly reduce the complexity of installation for the mainstream do-it-yourself consumer." ULE is the newest proven communications standard known for its reliability, security and long range. IHS Research predicts that as many as 50 million ULE products will be sold in 2015 alone. The technology operates on a reserved, 1.9GHz-frequency band that is free of interference and delivers unsurpassed range. As a result, homeowners can run all their VTech sensors and control devices on a point-to-point, encrypted network with up to nearly one-thousand feet of range. Other available technologies require multiple AC-powered repeaters to reach the same range, which drives up costs and makes those mesh networks less reliable. ULE is also one of the most energy-efficient smart-home technologies available today. VTech, the world's leading manufacturer of DECT cordless phones and a promoting member of the ULE Alliance, is committed to delivering ULE-enabled connected home products that are easy to install, are highly efficient and encrypted for added security. VTech will be exhibiting their wireless monitoring product portfolio at CES with the ULE Alliance, booth #70243 Sands. VTech is the global leader in electronic learning products from infancy to preschool and the world's largest manufacturer of cordless phones. It also provides highly sought-after contract manufacturing services and telephony solutions for the hospitality industry. The company has leveraged its expertise and success in cordless telephones to offer a portfolio of cost-effective, cutting-edge business phone solutions as well. VTech's success and expertise with DECT (Digital Enhanced Cordless Telecommunications) technology, the precursor to ULE technology, in addition to its contributions as a promoting member of the ULE Alliance, uniquely positions the company to bring innovative technology to the smart home market. Founded in 1976, VTech's mission is to design, manufacture and supply innovative and high-quality products in a manner that minimizes any impact on the environment, while creating sustainable value for its stakeholders and the community.